With all of the effort that goes into keeping your electrical contracting business running on a daily basis, it’s easy to overlook best practices. Sure, there are probably lots of things you’re doing well. But are those the right things to be spending your time on? 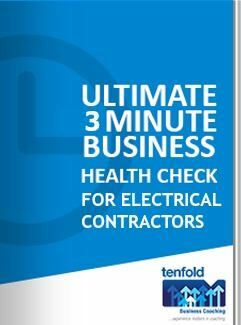 To help you, we’ve compiled a 3 minute health check for Electrical Contractors, so you can take the pulse of your business. Find out what a healthy, growing electrical contracting business looks like by downloading this free health check. You’ll be glad you did! Yes, I want this health check!